What's the worst of the bad things that health insurers do? I worked for seven years with a health insurance company. During that period of time, I heard plenty of complaints -- not just about my employer, but about health plans in general. People groaned about claims that were denied, premiums that were too high, and plenty of other issues. One thing, though, stood out to me at the time as the biggest grievance of all. What was this huge gripe? Poor customer service. That was more than a decade ago, but based on a recent survey from Temkin Group it appears that the single worst practice of the health insurance industry remains the same. Health insurers just don't treat their customers very well. A recent survey from Temkin Group asked 10,000 U.S. customers to rate their experience with 293 major companies representing 20 industries. The health insurance industry ranked third from bottom -- ahead of only television service providers and Internet service providers. Coventry Health Care, which was bought by Aetna (NYSE: AET) in 2013, ranked at the very bottom of the 293 organizations in the survey. Aetna itself wasn't too far ahead; the big health insurer tied for the No. 264 spot with five other companies. One of those companies was fellow health insurer Anthem (NYSE: ANTM). Of the bottom 50 companies in the Temkin Group survey, 10 were health plans. Joining Aetna, Anthem, and Coventry were four Blue Cross and/or Blue Shield plans, Medicaid, Cigna (NYSE: CI), and HealthNet (NYSE: HNT). Cigna ranked in 274th place, while HealthNet held the No. 288 position. Three health plans stood well above their peers in customer experience ratings -- TriCare, Kaiser Permanente, and Humana (NYSE: HUM). TriCare serves U.S. military staff, while Kaiser Permanente is a large non-profit health insurer. Humana was the only publicly traded health plan to rate significantly above others in the industry. Despite the poor showing for the health insurance industry, things have looked even worse in past years. The industry ranked at the very bottom for 2012. Health plans marginally improved customer experience scores for a couple of years afterward but showed a decline between 2014 and 2015 (as did 13 other industries). There isn't much silver in this silver lining, though. The average customer experience rating for the health insurance industry is classified by Temkin as "poor". The very best health plan, TriCare, only received an "OK" rating. No health insurers received "good" or "excellent" customer service scores. This consistently dismal performance begs the question: Why do health insurers seem to treat their customers so poorly? Perhaps one answer can be found by looking at the performance of the stocks of public companies ranking among the lowest in the Timken Group survey. 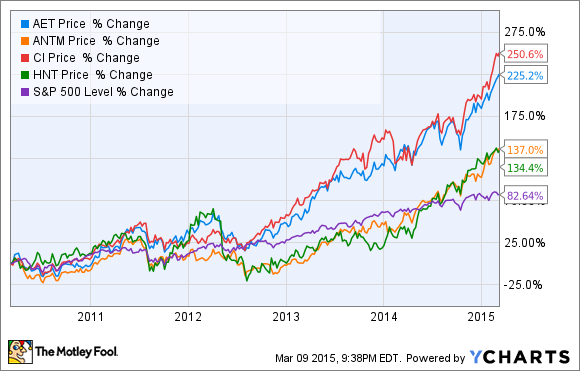 The reality is that each of these companies has easily outperformed the S&P 500 index over the last five years -- with Aetna and Cigna really skyrocketing. If the health insurers have indeed had sub-par customer service, it sure hasn't hurt their share prices. And with the stocks soaring, why would management be overly concerned about their rankings on a customer service survey? To be fair, though, many of these companies do try to focus on improving customer service. It's probably not a coincidence that two of the better performers in the industry, Kaiser Permanente and Humana, use Bain and Company's Net Promoter Score system to help measure and improve customer service. The Net Promoter Score adds the number of "promoters" of a company (individuals who are extremely likely to recommend the company to others) and subtracts the number of "detractors" (those who are not likely to recommend the company). The higher the Net Promoter Score, the more happy customers should be with the company and its products. Cigna also uses the Net Promoter Score system but fared poorly in the Timken Group survey. However, Cigna only began using the system in 2013. And it has seen considerable improvement in its internal metrics. I wouldn't be surprised if Cigna ranks higher in the future if it continues to focus on customer service improvement. There is one solution that holds perhaps the most potential to make health insurers focus more on improving customer service: competition. The more health plans have to compete to win customers, the better they will have to treat those customers. Competition is also a key ingredient for keeping prices under control. If you're displeased with the service of your current health plan, take a look at voting with your pocketbook and finding another insurer. And if you're an investor wanting to add a health insurance stock to your portfolio, pay attention to what the companies you're interested in are doing to provide better customer service. Even though the stocks of insurers that rated poorly on customer service have performed well in recent years, increased competition spurred by current (and potentially future) health reform measures could change that dynamic. As competition increases, organizations that do the best at keeping customers happy should be more likely to perform well over time.